I know, I know. It can’t really “save” the world. But it has so much upside it deserves some hype. This week the National Bike Summit is convening here in DC. 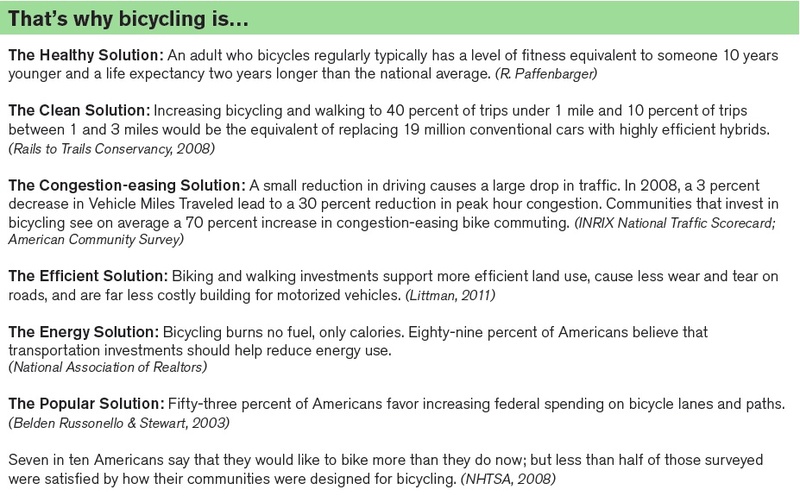 And if there is one takeaway it is that biking is a supremely cost-effective investment. In a town where almost nothing gets decided in a rational manner that focuses on costs and benefits (and instead gets hijacked by ideology, special interest money and cable madness), it’s always important to hammer away at this point. And the League Of American Bicyclists is doing exactly that, highlighting lots of research on how biking pays off big-time. In 2009, we released a literature review of the best research into the economic impacts of investing in bicycling infrastructure. Since then there have been several good additions. Since 1990, the City of Portland saw an increase of 14,912 in daily bicycle commute trips and 37,006 in daily auto trips. Cost-effective: Between 1995 and 2010, the Portland region spent $4.2 billion on roadway improvements and $153 million on all active transportation improvements. Since 1990, the City of Portland saw an increase of 14,912 in daily bicycle commute trips and 37,006 in daily auto trips. The cost of a new auto trip in Portland was approximately 22 times the cost of a new bicycle commute trip. By 2040, investments in the range of $138 to $605 million will result in health care cost savings of $388 to $594 million, fuel savings of $143 to $218 million, and savings in value of statistical lives of $7 to $12 billion. The benefit-cost ratios for health care and fuel savings are between 3.8 and 1.2 to 1, and an order of magnitude larger when value of statistical lives is used. 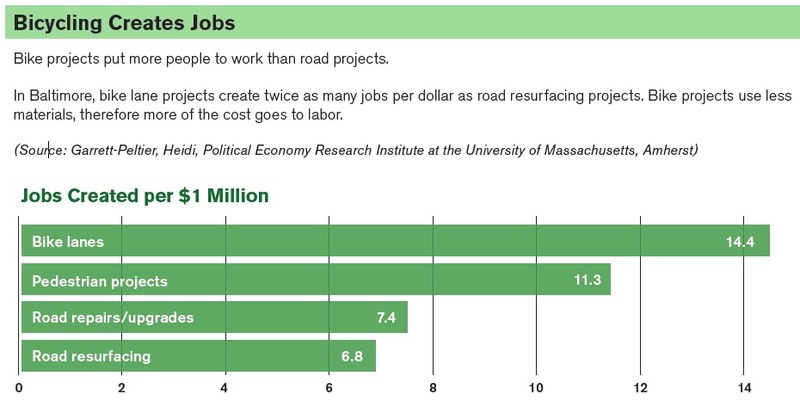 Job creating: A Baltimore study shows that for each $1 million spent, striping bike lanes and signing bike routes creates twice as many jobs as repaving and repairing roads, thank to a favorable labor to materials ratio. Economy supporting: Bicycle tourism brings in a $1 billion to the Wisconsin economy, in addition to the $556 million from manufacturing, distribution, and retail. So dig in and go wild. And keep on riding. Not to encourage you to become a bike bore, but here are 5 slides to get you started (from the National Bike Summit program). 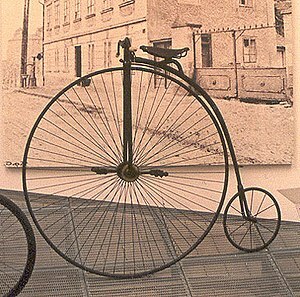 I never really understood why people did not enjoy biking; enjoying rollerblading, skateboarding, using a scooter or jogging is one thing, but it’s another to just give an excuse “I don’t like it” and use your car to get around instead. I will admit I haven’t gone on my bike recently due to weather and a summer job, but when I do get on it, I always find it such a simple yet effective way to get around town to get errands done (drop things off at library, run to the plaza, pick up items for family members, etc). Feels good at the end, too!